Marilia April 13, 2019 Comment? 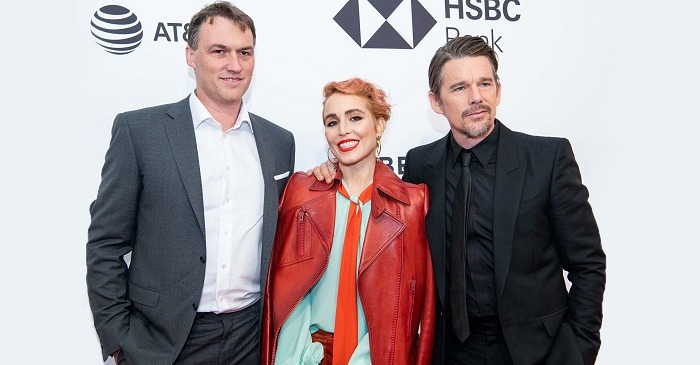 Noomi Rapace posed at the ‘Stockholm’ New York Premiere red carpet alongsite her co-star Ethan Hawke and director Robert Budreau at Museum of Modern Art on April 11. Noomi Rapace, Ethan Hawke and Robert Budreau discussed ‘Stockholm’ at Build Series ahead the New York premiere. Watch below the Q&A and check our gallery for high quality images! Marilia January 15, 2019 Comment? 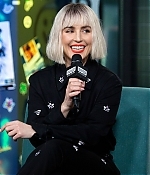 Noomi stepped out at Build Series to discuss about her new Netflix movie “Close” alongside director Vicky Jewson. The movie premieres this weekend, January 18. Below you can watch the Q&A and also check our gallery for HQ pictures. Marilia January 04, 2019 Comment? Marilia October 10, 2018 Comment? Frederik May 12, 2018 Comment? 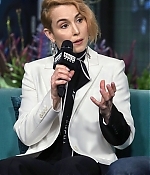 According to Variety, the upcoming psychological thriller “Angel of Mine,” starring Noomi Rapace, is set as the first acquisition by R & R Films, a new Australian distributor. The company was recently established by industry veterans Richard Becker and Robert Slaviero. The film goes into production this month in Melbourne, Australia. It is the story of intuition and obsession featuring a couple coming to terms with the untimely death of their daughter. The woman becomes convinced that another girl is her own. The script is adapted by Luke Davies (“Lion”) and David Regal from the French film “L’Empreinte,” by Safy Nebbou. Kim Farrant directs. Alongside Rapace, the film stars Yvonne Strahovski and Luke Evans. Other cast includes Richard Roxburgh, Finn Little, Rob Collins, Tracy Mann, Pip Miller and Rachel Gordon. Becker is a veteran who for years headed the sales, production and distribution group Becker Film. Slaviero is former CEO of Hoyts Distribution and Studiocanal. “Farrant showed her promise as a director with the powerful film ‘Strangerland,’ and she has once again attracted an incredible international Australian and international cast to this production,” said Becker. “I couldn’t resist Luke and David’s compelling script. It a story that every parent will identify with.” “Angel of Mine” is a SixtyFourSixty and Garlin Pictures production with principal investors Magna Entertainment and Screen Australia, in association with Film Victoria. Producers are Su Armstrong, Brian Etting and Josh Etting with executive producers Brian Rosen, Nadine de Barros and Robert Ogden Barnum. Fortitude Intl. is handling international sales on the film at the Cannes Film Market. Frederik April 21, 2018 Comment? 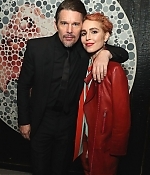 On Thursday, Noomi Rapace and Ethan Hawke have attended the Tribeca Film Festival alongside director Robert Budreau to celebrate the world-premiere of “Stockholm.” So far, only The Hollywood Reporter has posted a review, so let’s wait for more to drop. In the meantime, lots of pictures from the premiere have been added to the photo gallery with many thanks to Joan for sending them in. Edit: More reviews have been added, and it’s great to see good reviews for the film and especially praise for Noomi’s performance! 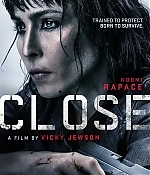 As the hostage who will come to most closely identify with the outlaws, Rapace has the film’s biggest job. She’s not so insensitive as to make it look easy. Bianca is married with two young children, and, judging solely from Rapace’s mien, harbors no fantasies about running away with a rogue. But she notices every thing Lars does to make this ordeal easier for her, sees how he is subtly disrespected by the man he’s trying to rescue, and, late in the plot, realizes Lars is the same criminal who once saved the life of an old man while robbing his house. And just as important, Bianca is allowed a few bits of contact with her husband (one of which is a nervously comic highlight), and that decent, frightened man lets her down in banal but telling ways. Enough filmmakers have nailed the early ’70s that even if you didn’t live through it, you can tell when a movie misses the era. In “Stockholm,” the hair and clothes are accurate in a costume-shop way, but the atmosphere is too slick and bright and punchy. 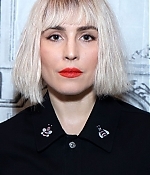 The one performer with the right desultory presence is Noomi Rapace, under big glasses and long straight sandy blonde hair held back in a bun. Her Bianca just wants to stay alive and get home to her two children. The question is, what’s her best strategy? The movie goes out of its way to convince us that Lars is a sympathetic character, flying into a panic over his hostages’ well-being as often as he flies into a rage. In another person’s hands, Lars would have probably veered toward comic relief or even mentally disabled, but this incompetent, outrageous robber is given pathos by Hawke’s no-holds-barred performance. He’s supported by a revelatory turn by Rapace, who lends a quiet strength to Bianca, and Mark Strong’s stoic straight man.